Roch Hart‘s first steps into fine furniture making were the result of a big dilemma. 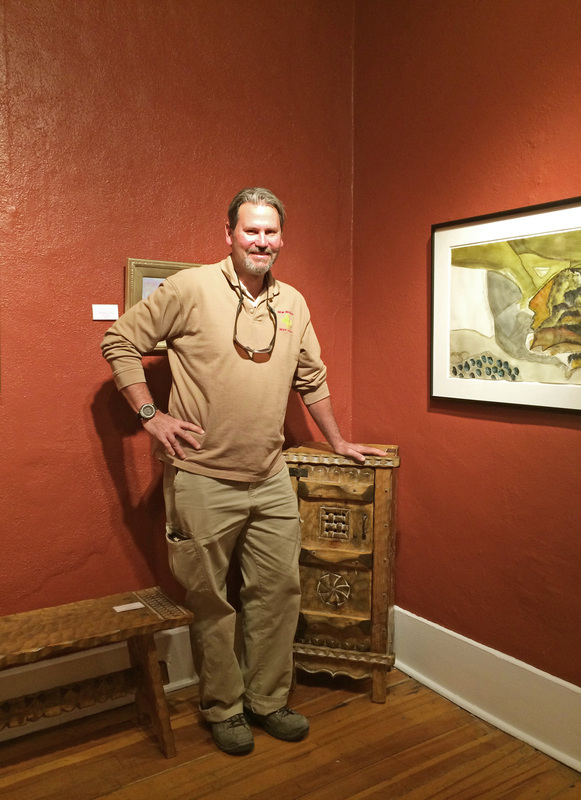 “I fell in love with Spanish colonial furniture. I had to have it, but I couldn’t afford it,” he says. He had never learned a craft before, but he was determined to do something. He started by buying all the books he could find on building furniture. More than two decades later, Roch pulls up to Matthews Gallery in a big red jeep. He takes two impeccably hand crafted pieces of furniture from the trunk. 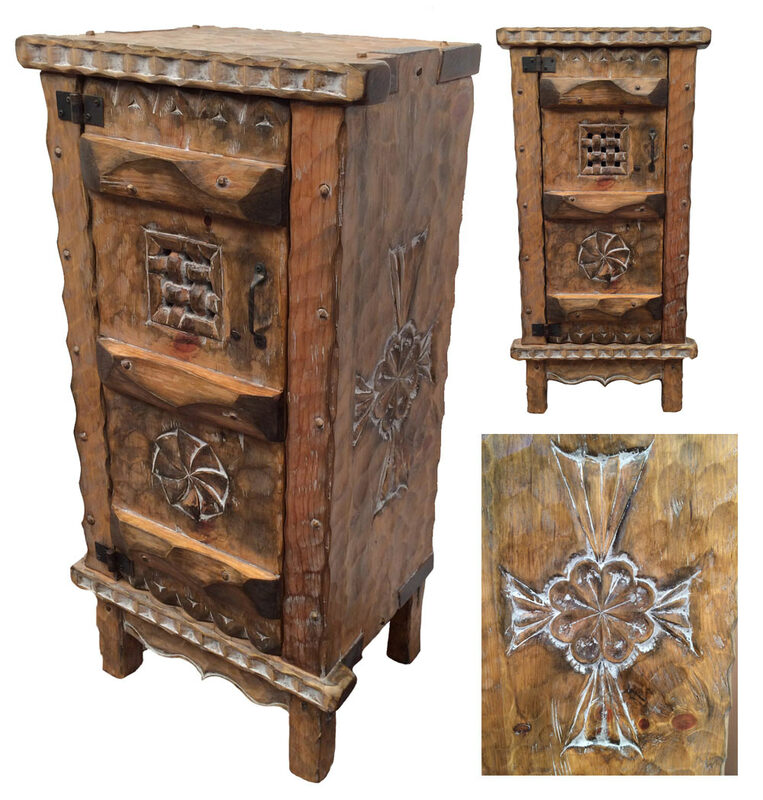 One is a tall corner table emblazoned with a Cochiti Pueblo-inspired design, and the other is a pie safe with intricate latticework and a special type of dovetail joint in the door. 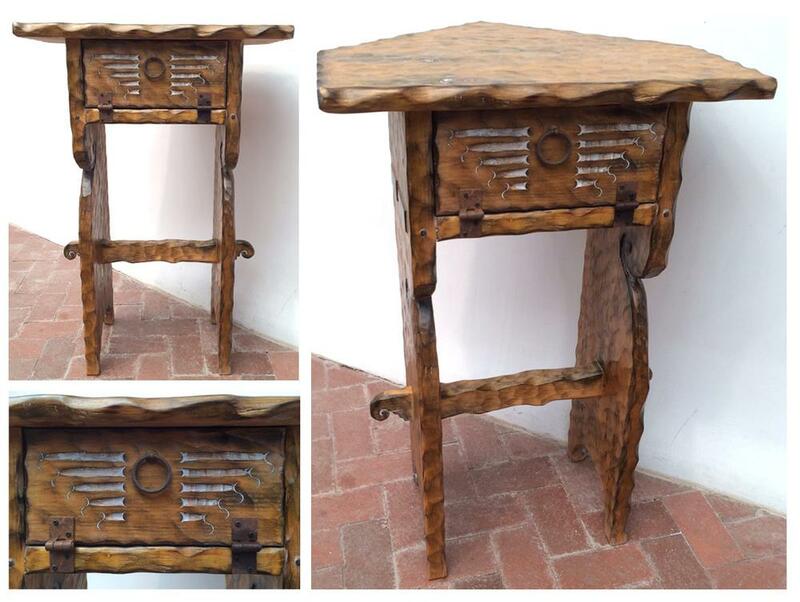 Roch is the very first fine furniture maker to join our stable, and his mastery of the craft is truly spectacular. In a way, these beautiful objects are generations in the making. Roch’s great grandmother came to Santa Fe in 1881. She was a single 16-year-old woman who braved the Old Santa Fe Trail, probably to escape an arranged marriage. Soon after her arrival she married a German man and they opened a mercantile near Canyon Road. She was also a great admirer of native art. She taught Roch about kachina dolls and paintings she collected. Roch’s mother took it one step further, trying her hand at retablo painting. Roch took a different path, enrolling at New Mexico State University and then studying to be a police officer. He spent 20 years at the Albuquerque Police Department, but his love for New Mexico’s multicultural history always stuck with him. When he got interested in furniture making in the early 1990’s, Roch started by studying the intricacies of the Spanish colonial style. He learned that a particularly sturdy joint, the mortise and tennen joint, was the only one Spanish colonists were legally allowed to use. He also discovered that the pervasiveness of trasteros (a Southwestern style cabinet) was due to a high colonial tax on closets. “At the same time that I was learning all this, I realized I wanted to do something different,” Roch says. “I didn’t want to keep replicating colonial.” The budding craftsman’s big breakthrough came on a visit to the Nicolai Fechin House museum in Taos. Fechin (1881-1955) was a Russian painter and craftsman who settled in New Mexico in 1927. He purchased a two-story adobe home and greatly expanded it over the next few years, carving intricate doors, windows and furniture pieces that were inspired by European and Native American aesthetics. On that first visit to the museum, Hart was busy crawling on the floor and inspecting every angle of Fechin’s furniture when the artist’s daughter Eya appeared. They started talking, and she recognized his passion for the craft. “She had so much in-depth knowledge, and I didn’t even know who she was,” Hart says. She walked him through the house and pointed out different styles and techniques her father used. “Fechin blew me away,” Hart says. “He took art and applied it to furniture. I had felt caged in by the things I was learning, but all of a sudden I realized I could do anything I want.” Just as Fechin had drawn from multiple influences in his work, Hart began to use styles and motifs from the different cultures around him. Hart carries his latest works through the gallery to our freshly painted Southwestern art room, carefully placing two pieces in opposite corners. He’s eager to point out his stylistic choices. The rosettes on the sides of the pie safe are inspired by Native American metalworking techniques, his choice of joints was influenced by Fechin and the gridded design in the front is all his own. On the front of the corner table, a stepped carving bordered by elegant curves represents a Cochiti blessing. “I incorporate my love for the Native arts, for the Spanish and for my European ancestry,” Hart says. “I try to tie a little bit of everything into every piece.” The works before us bear clear markings of the artist’s rich ancestry and influences, but they also hold a heaping dose of something else: Hart’s soul. For more news about Roch Hart’s latest work, check out his artist page on our website and connect with Matthews Gallery on Facebook, Twitter and Pinterest.